JmB Silver shared a post. JmB Silver shared a photo. And Tea and cake!!!... 0nce it’s gone it’s gone! Some amazing discounted limited editions - some items from £2.!!!! Bargains! The plastic free journey does not only apply to my business @jmbsilver but I am also making changes in my home life. Thanks #primalsuds for my order! I am very impressed with the completely plastic free compostable packaging and the products smell fantastic - I have used the Mop Top Shampoo Bar for the last 3 days and already my hair feels fab and is more shiny - no more plastic shampoo bottles for us!! I also ordered the No BO Bar Smoo - not used it yet as using up my last natural deodorant so will let you know how I get on 🙂 - but just happy that again, no plastic deodorant tubes for me. Handmade unique split shank ring made with tourmalinated quartz and recycled sterling silver which has been finished with an oxidised silver look. The quartz gemstone is shot through with fine mineral strands of tourmaline. This ring is one size only which is UK Size O and the ring is hallmarked. February's birthstone is Amethyst - this pendant is handmade using recycled sterling silver and has two tube set amethysts - available @jmbsilver. Tell UK supermarkets to ditch throwaway plastic packaging! JmB Silver is in Herne Bay, Kent. Handmade earrings and necklace - sterling silver and semi precious beads representing the 7 chakras by their colours. What is on your bench today? 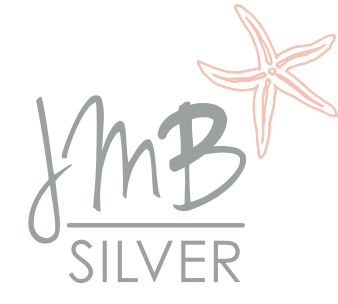 We are very happy to announce that JmB Silver is now a plastic free business!! So you can now shop with us knowing that we are a Plastic Free Business!! Also well done to Amy Mason The Bead Pot who has also gone plastic free in her business 😊Two fabulous jewellery designers signed up this morning. From the Made in Herne Bay group their work is exceptional. JmB Silver is in Argaka. What made you want to change the world 🌎? Although I have always been keen to recycle ♻️ and to care for the environment , I really began my ethical journey last year when I was on holiday in Cyprus. I was lucky enough to be snorkelling in the beautiful blue Mediterranean Sea but was horrified by the amount of visible plastic floating around!! We spent time that week trying to pick up as much rubbish as we could when we were at the beach but the experience stayed with me and when I returned to the UK, I looked into options and choices we could make at home to try to do our bit for the environment and make a difference. For example - using reusable water bottles, buying a soda stream with glass bottles, reusable coffee pods and straws, wax food wraps, glass milk bottles, reusable bags for fruit and veg - to name a few changes. I am also working hard in my business JmB Silver to recycle, source and use sustainable materials, support other small local businesses, be plastic free and to understand more about running an ethical business. What other changes/choices can you suggest to help reduce plastic in the home? Stop buying plastic bottles and help reduce plastic in the oceans. Refill those you have and buy a reusable drink bottle. Save money and make a difference. Would you be able to make a Robin? Sign up to our JmB Silver monthly newsletter and be entered into a competition to win these lovely hand made "Starry Night Stud Earrings"
Winner drawn at random n 28/02/2019. Do you make clip on earrings? Garnets are the birthstone for January and also associated with the second wedding anniversary. This is a new addition to the Ripples Collection by @jmbsilver and is designed to continue the rippling water texture on the piece with the addition of two 3mm garnet stones. The pendant is handmade using recycled sterling silver. Thank you to all my wonderful customers who made the decision to support a small business during 2018 and buy from us! !